If you don't like belts and crazy hair, Final Fantasy VII's aesthetic might not be to your liking. 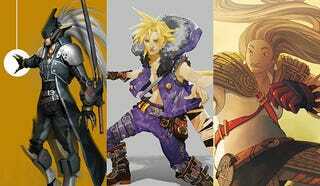 Here, then, are some artist's ideas on what Final Fantasy VII could look like. These pics were done by the community at Brainstorm, just like the Batman images we posted last year. The rules were they could take any character from the game and put their own spin on it, which they've duly done. Note that Brainstorm isn't just an art community, it's also a school, whose next workshop is being done by the very talented David Levy.